Take a secret 19th century velodrome in the heart of Budapest, a handful of vintage cars and bikes, and a group of petrolheads dressed up in revival gear ready to brave the Siberian chill on an April day, and you’ve got yourself a perfect afternoon. We went along for the ride on the terrifying banked oval in a 1967 Autobianchi Bianchina. You may be forgiven for never having heard of the Millenáris Velodrom, a bicycle arena built in 1896 to celebrate the 1000th anniversary of when the Hungarians streamed across the Verecke Pass in the Carpathians to colonize an enlarged version of modern Hungary. I’ve lived in Budapest for ten years and I hadn’t heard of it until two weeks ago—and I met a number of native Budapesters in the days after who were similarly ignorant. Perhaps due to its low profile, the velodrome is not an easy facility to bump into at random and it’s also in a state of vague abandonment. But the engineering is apparently solid: after 115 years of battled existence—where “battled” includes politics, real estate schemes, and direct artillery hits during the Siege of Budapest—the track was ready to welcome a ragtag band of veteran cars and motorcycles on a windswept April day. The event was the launch of this year’s Oldtimer Expo, Budapest’s annual veteran show, where, contrary to what the name might suggest, senior citizens are not on display: oldtimer, pronounced as if in English, is a Hungarian term for classic cars 30 years or older. The stars of the show were supposed to be a pair of Bugatti Type 35 race cars from Austria, but they couldn’t make it. No worries though: events like this are never about paper stats and gleaming history but all about the noise. And nobody could complain about the noise at the Millenáris. The Bugatti-ish blue car on top is a Salmson, made in the 1920s by a French engineering company known for its 9-cylinder water-cooled radial aircraft engines, and it made a rather pretty, easygoing burble of a noise, but it was nothing compared to the old motorcycles which followed, chief amongst them a 1958 Ducati 175. The noise made by its “simple, high-revving, over-square (62 x 57.8mm) wet-sump unit with a single overhead shaft-driven cam,” as lovingly described in The Telegraph, was such a riot of rumbling, mellifluent beauty that it made me forget about my fear of standing right next to banked ovals with speeding motorcycles racing along them and also about the terribly cold wind, and I did nothing but stand at the bottom of the steep banking and listen to it lap after lap after lap until it retired to the improvised pits. A sad aural vacuum followed. It didn’t last long. After combating the cold with a double espresso served from the back of a Piaggio Ape scooter truck, I met up with my friend and ex-colleague Zsolt Csikós, the man who once called Tony Crook and got himself into a Bristol Fighter. He was driving his robin’s egg blue 1967 Autobianchi Bianchina Panoramica, a car whose power is inversely proportional to its long name, courtesy of an 0.6-liter Fiat engine good for 22–24 hp, a major upgrade on the original Bianchina’s 17. Into Zsolt’s car we all piled to show a middle finger to high school physics and power-to-weight ratios: Zsolt, Jalopnik ex-intern Máté Petrány, my lovely wife Natalie, and I. Máté nursed his epic hangover, I faced my terrible fear of banked ovals, Natalie clutched her satin collapsible top hat, grabbed onto her blue Yemeni scarf, and off we went. It was huge, dizzy, hollering fun. By lap two, my trust in physics was restored and my fear of ovals was gone. By lap ten, I was getting the gist of Zsolt’s precise racing lines. The little Bianchina soldiered on, the little air-cooled engine gave us each 5.5–6 hp of pop, and we left the velodrome giggling like schoolchildren, chilled to our bones and tendons, racing on foot to the nearest subway stop to hunt for piadinas and flat whites. Click through the gallery to see and read more! The Ducati 175 of my aural dreams. It’s all hand-hammered bits and pieces of unpainted aluminum and love. It makes you emphatize with motorcycle geeks at once. Zsolt ready to attack the banked oval with the Bianchina. He was the perfect man for the job: he once drove a hot Saab at Talladega Superspeedway for an hour at 150 mph. The spectacular blue-tiled building behind the velodrome is the headquarters of the Geological Institue of Hungary, an Art Nouveau masterpiece designed by the great 19th century architect Ödön Lechner. A surreal sight on the oval is a Citroën DS floating along on its magic carpet hydropneumatic suspension. Hanging out the rear window is photographer and motorcycle poet Árpád Zirig. Photographs do a terrible job of showing just how steep a banked oval is. Physics help every vehicle handle it with aplomb. What you cannot do is think about it while up there. 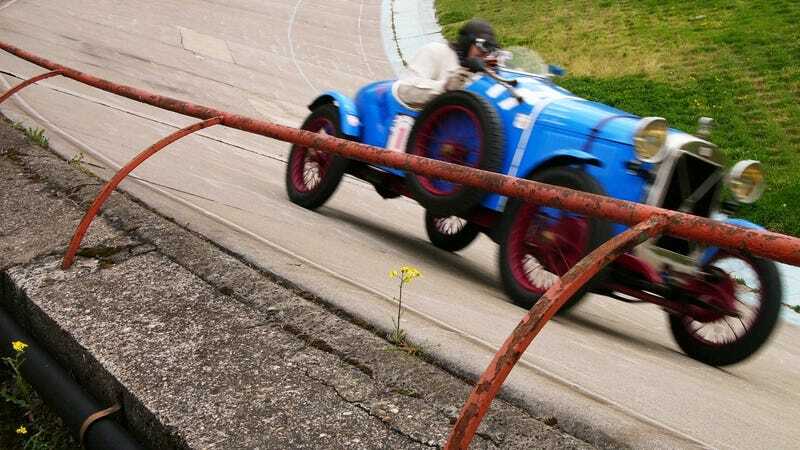 Drivers made an effort to dress the part, donning vintage leather helmets for the 1920s Salmson. The single most useful piece of equipment for the day? That heavy wool scarf! This little guy is a Velorex: a three-wheeler powered by a Jawa motorcycle engine with vinyl for bodywork, designed in Czechoslovakia as a specialized vehicle for the handicapped. There were three of them, and they carried surprising speed through the corners. There was also a proper Jawa on display, and the noise it made was second only to the sublime Ducati’s, punctuated by terrific bangs on downshifts. Zsolt driving his Bianchina. His son Bálint, wearing a Tyrolean hat, contemplates the drop to the bottom. It’s easy to learn the physics of corners when your father is the biggest vintage car nut the Carpathian Basin has seen in its 1,115 years of Hungarian occupation.